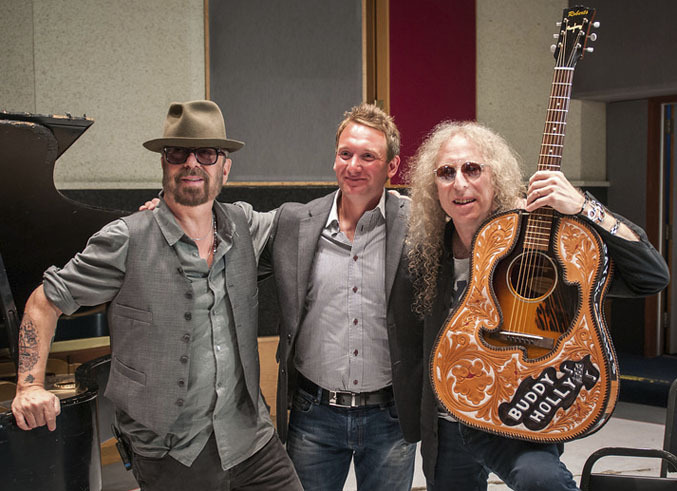 Waddy Wachtel was presented with a custom made J-45 guitar, just like the original one played by Buddy Holly, by Dave Stewart on behalf of The Buddy Holly Educational Foundation at Capitol Records on 5/21/13. 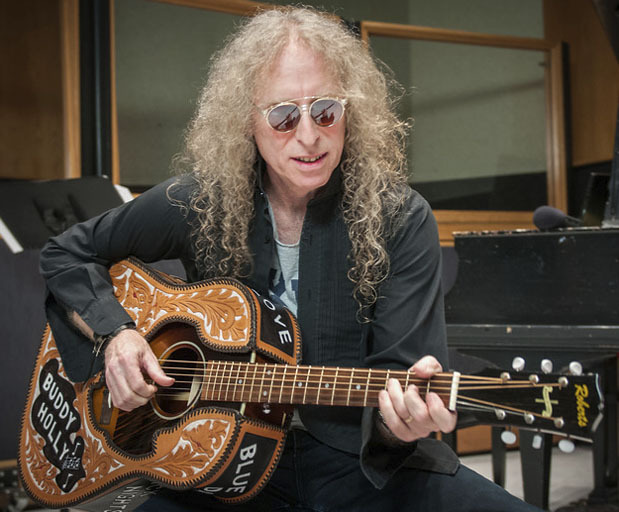 There are only a few performers chosen to receive one of these special guitars by TBHEF, and Waddy was delighted to be selected as one of them. 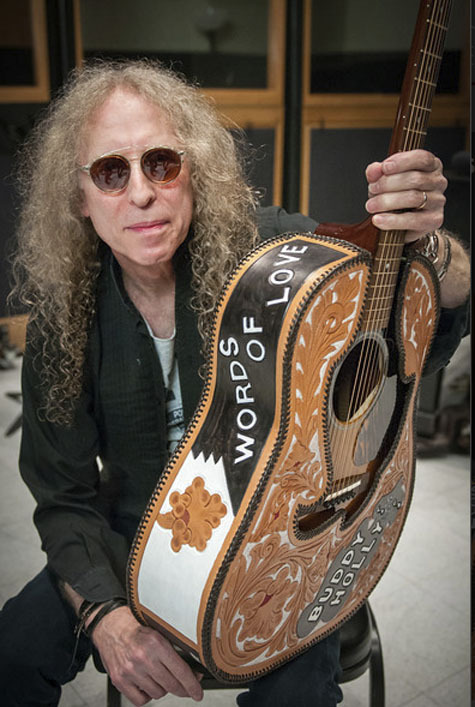 Each recipient is asked to pick a Buddy Holly song title for the name of their guitar - Waddy chose "Words of Love." 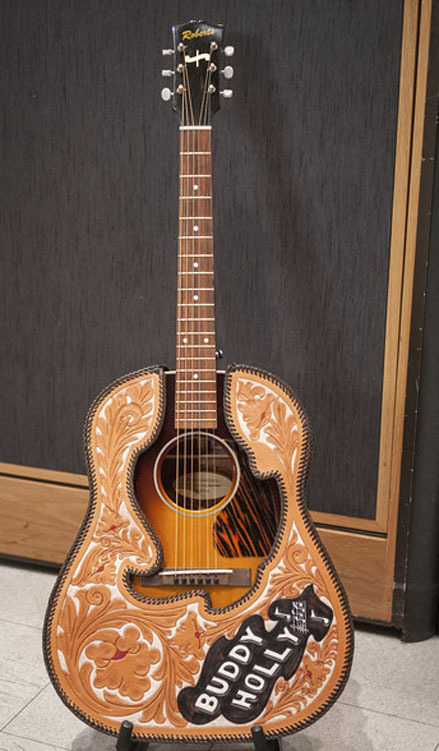 This amazing guitar was made for him by the renowned luthier Daniel Roberts, and the incredible leather cover was made by R. O. Brooks.. 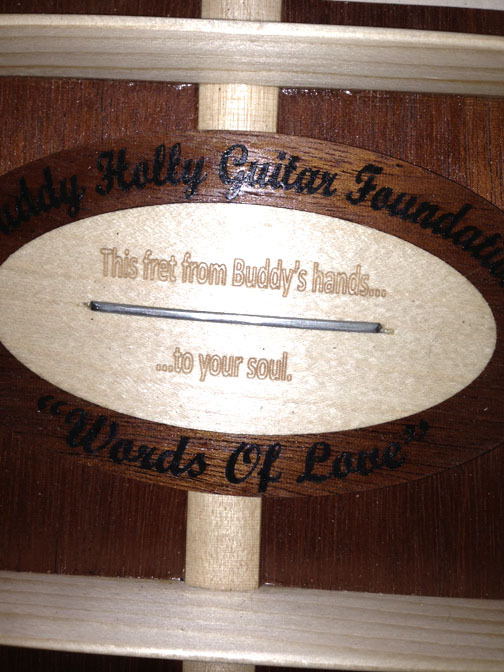 There is a plaque in the guitar with a fret from Buddy's original J-45. A small group of friends were happy to be there honoring Waddy and this beautiful guitar. It was a festive and exceptionally delightful presentation ceremony. 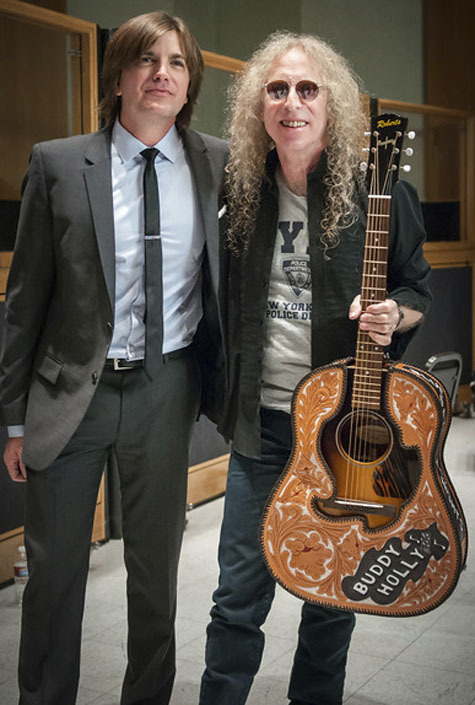 The Buddy Holly Educational Foundation was founded by Peter Bradley and Maria Elena Holly in 2010. 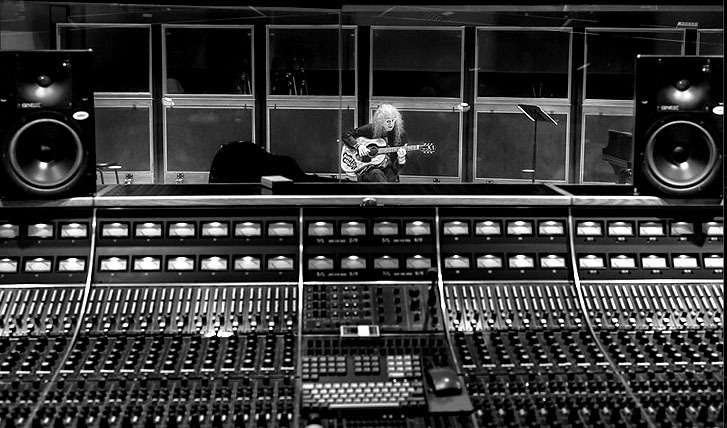 The mission of the Foundation is to honor Buddy's legacy as well as to make Buddy and Maria Elena Holly’s dream of extending musical education, including songwriting, production, arranging, orchestration, and performance, to new generations regardless of income or ethnicity or learning levels. The Foundation will raise funds to encourage young people to learn how music can change their lives, to enable schools to provide educational materials, and to advocate for the inclusion of musical study in teaching. To honor internationally renowned artists from all genres of music and countries, the Foundation will present to them perfect replica’s of Buddy Holly’s original Gibson J-45, on which he wrote so many of his legendary songs. These Foundation “Ambassadors” will each receive on loan one of these unique guitars, each one containing an original fret from Buddy’s J-45. 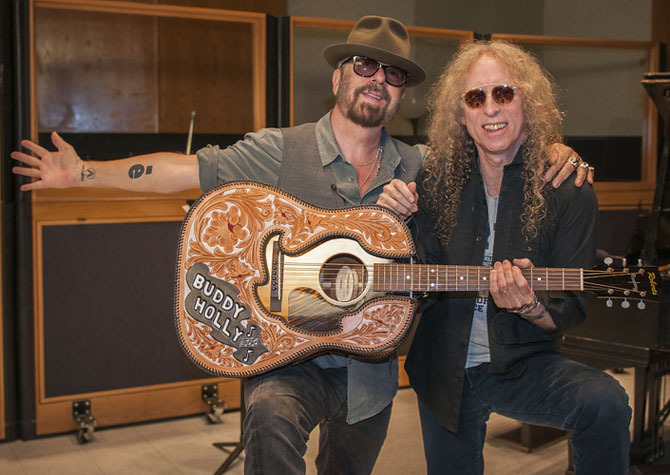 Each guitar will be named after a song from Buddy’s amazing catalog, with a hand-made outer leather cover identical to the one Buddy made himself for his first guitar.